Camping & Tramping with Roosevelt. Boston and New York: Houghton, Mifflin and Company, c1907. John Burroughs was a naturalist and prolific nature writer, starting with the publication of Wake-Robin in 1871. He was one of the most popular writers in America for several decades of the late 1800s and early 1900s. Burroughs was influenced by the writings and philosophies of Emerson and Thoreau. He was also a close friend of Walt Whitman. 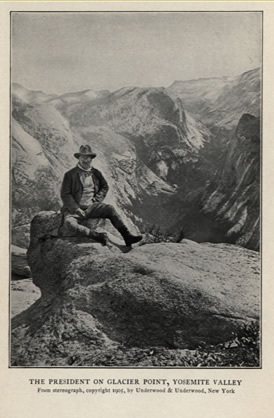 Over his lifetime he travelled with some of the most prominent people of American society, including John Muir, Henry Ford, and Theodore Roosevelt. Camping & Tramping with Roosevelt chronicles his western expeditions with President Roosevelt. Wake-robin. New York: Hurd and Houghton, 1871. Locusts and Wild Honey. Boston, Houghton, Osgood and company, 1879. Signs and Seasons. Boston, New York, Houghton, Mifflin and Company, 1886. Under the Maples. Boston; New York: Houghton Mifflin Company, 1921. John Burroughs Talks, his Reminiscences and Comments, as reported by Clifton Johnson. Boston: Houghton Mifflin Company, . The Last Harvest. Boston and New York: Houghton Mifflin Company, 1922.